Today for the Homemaking Linkup, I'm sharing my chili recipe. I've shared it here before but it's been a couple years so here you go! This chili is super good with my Spiced Cornbread. Mmm!! Rinse 6 cans beans in strainer. Place them in a pot with the refried beans and all other ingredients. Add 2-4 c. water. You want to start out with the chili quite a bit runnier than you like it. Cook and stir often until it has reached your desired thickness. This could be anywhere from a half hour to an hour and a half...depending on how much water you add. 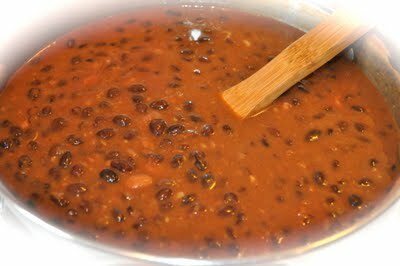 The more water you add, the longer you have to cook it and the more flavorful it will be as the beans absorb the flavors from the other ingredients. If you're in a hurry, just add a couple cups of water so there's a buffer there to keep it from sticking to the pan while it's heating up and dissolving the seasoning and you'll be good to go in about a half hour. 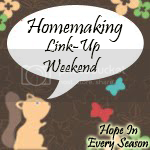 I hope you'll join me for this week's Homemaking Linkup. I love to feature some of the neat posts that are linked up so please make sure and put my button or a text link on your blog so you'll be eligible to be featured! There were posts both last week and this week that I really wanted to feature but didn't because there was no back link. The Proverbial Homemaker gave a very thorough lesson on creating your own seed storage binder. I love this---and not just because it's pink and green! Tauna has been a blogging buddy of mine for awhile now. She is so encouraging! Another blog that I'm really enjoying lately is 31 Cups. Gretchen has such awesome insights and I always come away from her blog feeling fed. 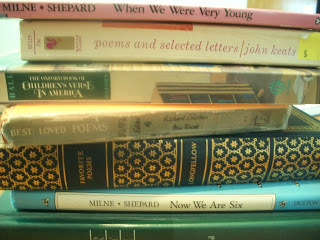 She linked up a great post about diving into enjoying poetry---I'm ready! What's In the Gunny Sack? Sounds delicious! thanks for sharing! Your chili looks VERY good !! Your chili looks delicious!Thanks for hosting the awesome party,Mrs. Sarah! Oh yum. I love trying new chili recipes. Thanks for hosting this linky party! Thanks for the linkup and I hope you have a blessed day. Thank you for stopping by my blog - it was good to hear from you! I love the family photo at the top of your blog. The recipe sounds delicious - it's still cold here and a bowl of chili sounds very good! The chili sounds and looks really good! Thanks for hosting! Sarah, I like the chili recipe. I might have to try that! Thank you for hosting! Your chili sounds so good...thanks for the recipe. Thank you for hosting as well as sharing at http://www.frugalfitfamily.com! I think I'm Link #63 this week. I heard someone say that chilli with beans is not chilli. And then, I realized by the comment above mine, that there isn't any meat in your chilli. Guess it works by preference, right? Right. I was wondering about your comment on linking back. I think you mentioned before that it needed to be in the post (which I do). Is it post or blog sidebar? Just curious. Enjoyed your post and I saw both of the featured posts last time! Mine is on ice cream cone cupcakes I did several years ago. PS - I did mean to say that your chili has some interesting ingredients in it - curious how it tastes. Sounds great. This chili looks delicious. I like your recipe, it’s cold here and I already have everything I need to make it. Me again!! Good for you foinding a bunch of Easter things at Salvation army!! Thanks so much for stopping by!! I hope you are having a good week!! That's sounds so tasty! Thank you for popping in to see me. Oh my...I do enjoy a good chili recipe! Thanks so much for sharing and also thank you for stopping by my pastel dinnerware post this weekend! ENJOY THE WEEK! We spent the last 5 years in Nebraska, where chili and cinnamon rolls are the local specialty. I really enjoyed that combination, so I am sure I'll love the spiced cornbread with chili too. Thanks for sharing your recipes! It is snowing here today...I want some chili right now. smile. Thanks for inviting the Marmelade Gypsy to play along with the homemakers. There are so many! I think I'd better wait till after Easter when I have time to be a good participant--they all look wonderful and lots of fun! Thanks for asking! Sarah, I have a recipe of my mom's called 'quick chili' that is so similar. The addition of the bbq sauce sounds yummy. I will try it next time. Thanks for sharing with SYC. Looks delicious! Thanks for sharing at Family Fun Friday! Sounds so good! Thanks so much for sharing this on The HomeAcre Hop! 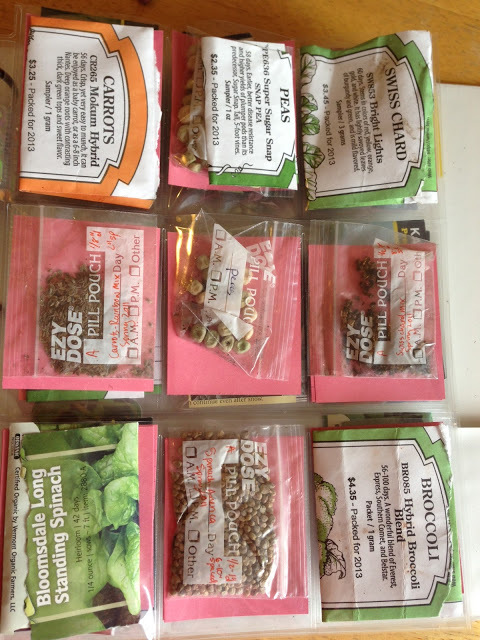 I changed the starting time for the hop to Thurs morning and we'll be announcing the winner of the seed giveaway! Thanks so much for hosting! Hope you're having a lovely week. I like this recipe! I make a version of this chilli whenever I make meatless chilli. Sounds yum and simple just like I like it! Thanks for sharing the recipe. Yum! Thanks fir sharing this over at WholeHearted Home.